Son of Frankenstein is not your average Frankenstein film. It may follow specific genre structures and extend previously created characters and narratives, but it also innovates these ideas, creating what is widely recognized to be one of the best of the Frankenstein bunch. While certainly not the final film in the Frankenstein franchise, Son was the last title to be taken truly seriously. This highly stylized film has exquisite German Expressionist visuals and a top tier cast. Bela Lugosi was in many movies in his career but his role as Ygor in Son of Frankenstein is one of his best performances, if not his very best. If the only Bela Lugosi you are familiar with is his eponymous lead in Dracula (Tod Browning, 1931) and the one played by Martin Landau in Ed Wood (Tim Burton, 1994), I plead with you to attend Son of Frankenstein at the New Beverly. There is a lot to see in this film and much to enjoy but it is worth it JUST to watch Bela Lugosi blow everyone else off the screen. The tragedy is that he was paid a mere $4000 dollars for this film while everyone else made a great deal more. Lugosi had real acting skill. The premise is simple. The original Dr. Frankenstein had a son: Baron Wolf Von Frankenstein (Basil Rathbone). He returns to the “scene of the crime” to reclaim his father’s heritage. Moving into the family castle, he meets Ygor (Bela Lugosi) and is persuaded to go back into the family trade – monsters. While the end of James Whale’s Bride of Frankenstein (1935) intimated that the Monster was destroyed, Son of Frankenstein ignores that narrative (or at least circumvents it) and creates a new drama. The Monster (Boris Karloff) having been saved by Ygor now needs the younger Frankenstein’s assistance to become “alive” again. This is intriguing to Frankenstein Jr. and he cannot resist becoming involved. Frankenstein Jr.’s decision puts the lives of his wife Elsa (Josephine Hutchinson) and young son Peter (Donnie Dunagan) at risk (not to mention those of the townsfolk). The reappearance of the Frankenstein family has drawn the attention of the police, Inspector Krogh (Lionel Atwill), who has made it clear to Wolf that he is not welcome and that if anything should happen…well, he will be held responsible. We all know what happens next, right? If this plotline sounds familiar, it should – Mel Brooks was heavily influenced by Son of Frankenstein (and its filmic predecessors) when he made Young Frankenstein with Gene Wilder. Many of the characters, plot devices and eccentric tonal shifts from the 1939 film were directly funneled into the classic 1974 comedy. While Rowland V. Lee’s film was intended to be a horror film similar to its forebears, the wonderful thread of black comedy running through it is undeniable. But be careful – this film is smart and not everything is funny. It is 100% supposed to be a scary movie. The jokes included are there for comic relief – to allow the viewer a bit of reprieve and joy from the tension. The comedy within Son of Frankenstein wants you to be in the joke, not outside of it. This is not a film to be laughed AT. The film was to have a triple terror triumph on the roster – Peter Lorre as Wolf Von Frankenstein, Bela Lugosi as Ygor and Boris Karloff. Universal would borrow Lorre from 20th Century Fox, and Lugosi and Karloff were already under contract to Universal. Lorre rejected the part, however. He was satisfied with his current role as Japanese special agent Mr. Moto, the “foxiest detective of them all.” Like many actors (then and now), he had a great fear of being typecast as a “genre guy,” so he wanted to branch out. Speaking of Mr. Moto, Willis Cooper, Son of Frankenstein’s screenwriter penned multiple scripts for the Mr. Moto series. Fun Fact: Willis later changed the spelling of his name from Willis to Wyllis because his wife was super into numerology! Director Rowland V. Lee was a central figure in the development of Son of Frankenstein. Having already worked with Basil Rathbone in the Agatha Christie adaptation, A Night of Terror (Rowland V. Lee, 1937), Lee put him in the lead role, supplanting Lorre. As submitted, the script had not included the role of Ygor. But Lee insisted that since Lugosi was already attached to the film, Cooper create a more extensive part for the actor. Bela had agreed on a very meager paycheck comparatively and was not expecting much from SoF, but Lee beefed up the role and thus allowed him to have regular work throughout the production. Lugosi may not have gotten paid much but he got paid more than he thought he was going to. Still, for what he did in the film, it was rather lousy. Karloff was paid $30,000 and had no speaking lines. 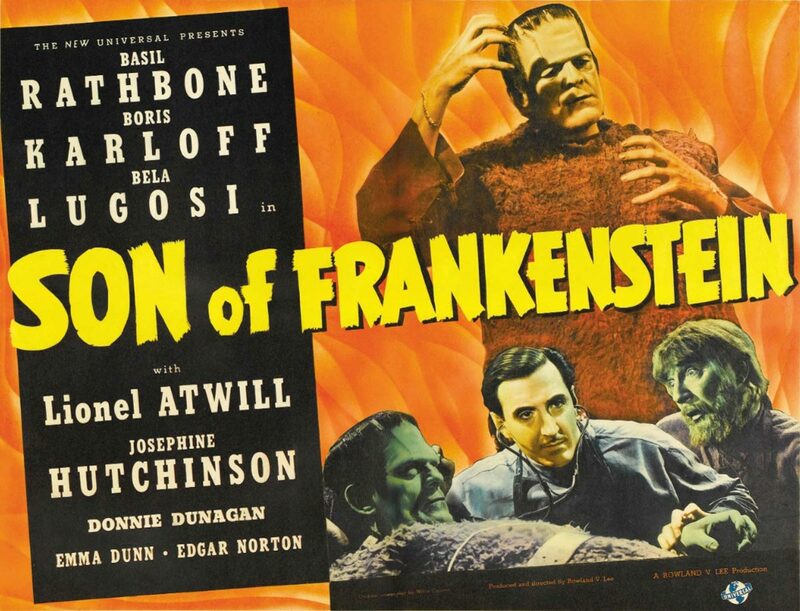 Son of Frankenstein was made and released during a renewal of the Universal horror genre. As the opening 1939 quote from Look Magazine pointed out, it is very likely that this could be attributed to the socio-political climate of the time. While most films do this, genre films are known to specifically mirror the cultures they are created by and the current affairs they are made during. The Gangster Cycle, film noir, women’s films…all correspond to periods in US History and social concerns. 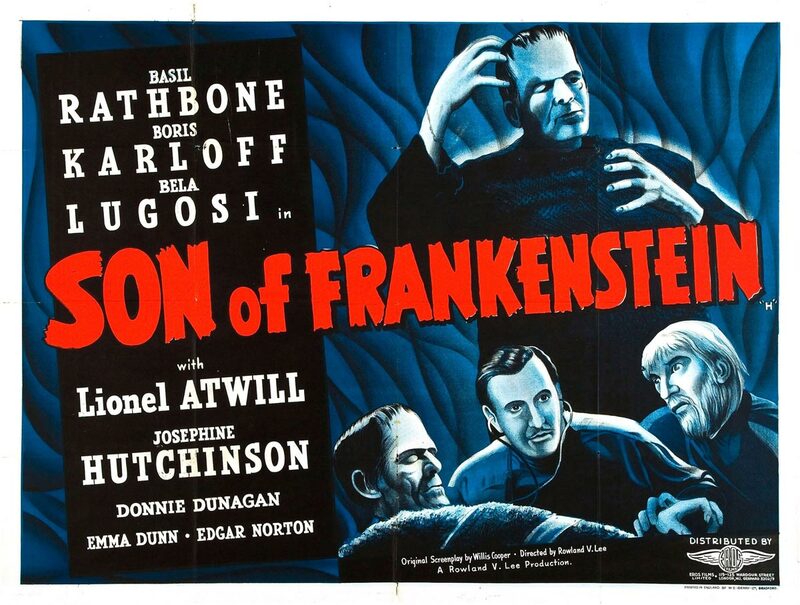 From this perspective, the public interest in a film like Son of Frankenstein is reasonable. SoF was released in January of 1939. In Roosevelt’s State of the Union address that year, he had said that while we weren’t at war, we were not at peace. “The deadline of danger from within and from without is not within our control,” he stated. All bets were off. No guarantees and we could easily be at war next week (which, OMGZ, we pretty much were). Was it any wonder that a film centered on the fragility of life and lack of boundaries was made and was so successful? Son of Frankenstein did exceptionally well financially. It broke studio box office records in Los Angeles, Boston and Richmond. It was a “hold over” in those cities as well as Cleveland, Baltimore, Buffalo and Washington. It even prospered in England, which was known to be a very hard sell for horror films. It may have gotten banned in Denmark and Finland, but getting high grades in the UK was a pretty great sign for this Universal Horror film. 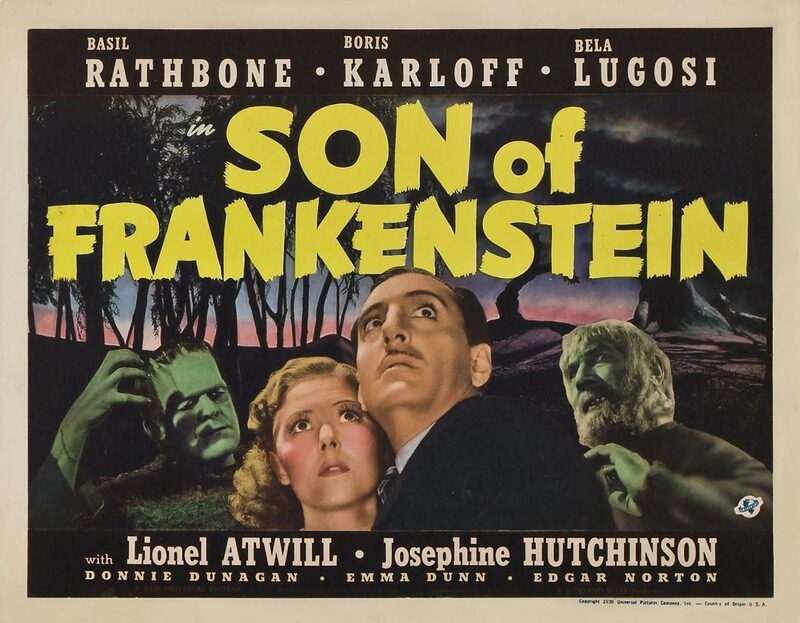 Popular in the midnight movie circuit, many theaters advertised the film as a “Midnight Shudder Show” or a “Spine Chilling Story” with “Weird Characters.” Theaters double dared their customers to attend Son of Frankenstein after having dared them a few years earlier to see Dracula and Frankenstein. It was all upping the ante! 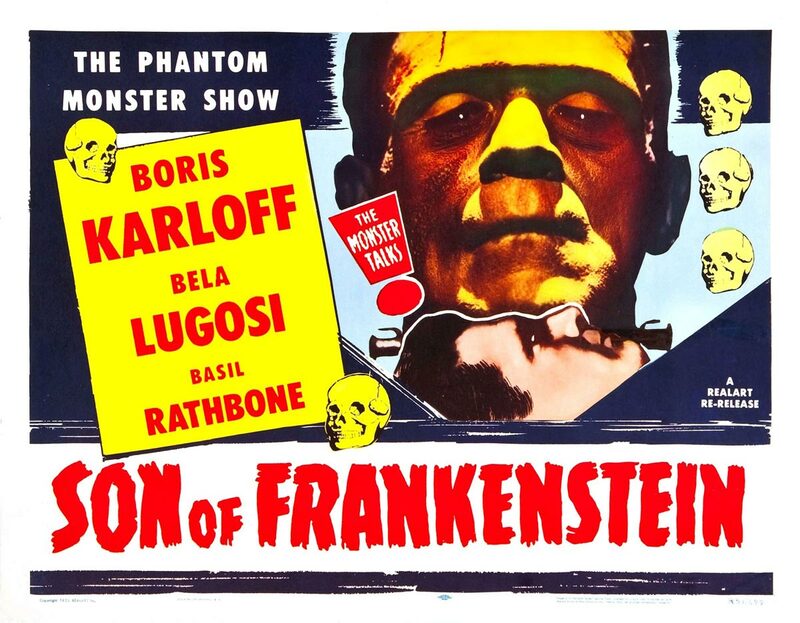 Son of Frankenstein was part of America’s renewal of horror films. Universal had prospered with this genre in the early to mid-1930s, but its popularity had started to peter out. In 1938, two of their earliest films (Dracula and Frankenstein) were re-released into theaters, surprising the studio by making money at a time when they really needed it. Universal decided to “reboot” the Frankenstein films and Son of Frankenstein was born. Son of Frankenstein is a unique film, not simply in its content and production history but in its on-set documentation. It was the place where Bela Lugosi, Boris Karloff and Basil Rathbone would get together and have tea together in the afternoons. 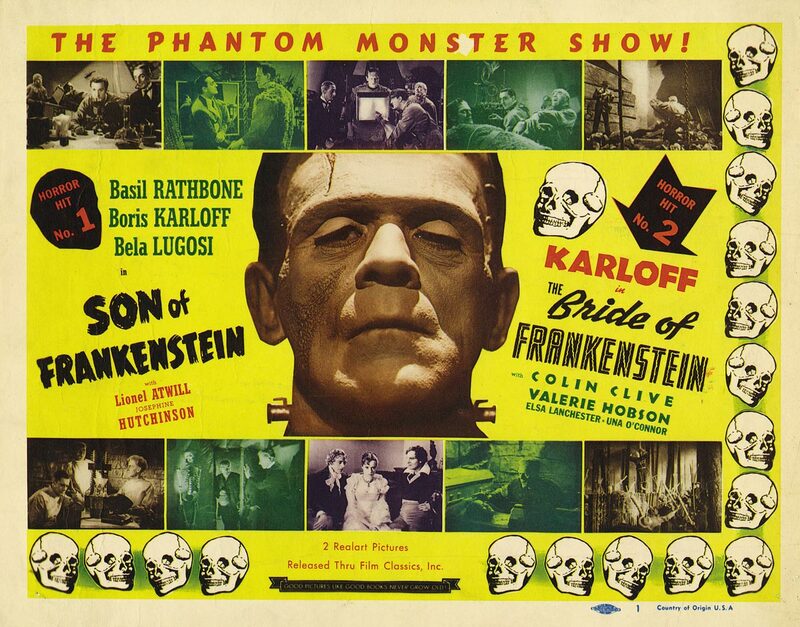 It was while shooting Son of Frankenstein that Sara Karloff, Boris’ daughter, was born. He rushed to his wife’s side, returned to set the next day, exhilarated. As Sara was born on her father’s birthday, the cast and crew gave Boris a party. A huge cake was decorated with the words, “Happy Birthday Papa.” Karloff also received a set of baby monster boots for the newborn. There is a rumor that SoF was to be shot in Technicolor. This is highly unlikely based on a few things: the cost of shooting a whole film in color, punctuality of production completion, and the results of the color test (which does exist). Son of Frankenstein went decidedly over budget and definitely over schedule so the suggestion of color was probably just a “what if” that Rowland V. Lee threw out to the execs. However, it remains as an incredible historical document from the film and the kind of on-set camaraderie that existed. It is actually part of the Karloff Home Movie collection and it is absolutely beautiful. It depicts Karloff’s wonderful sense of humor and famed make-up artist Jack Pierce’s handsome face! This film underscores the deep connection between the characters of Ygor and the Monster and it’s very touching to note that both Karloff and Lugosi had young children (babies, really) while this film was being shot. They bonded over many things while filming, but according to those around them, fatherhood was really what brought them together. Best monsters ever.